Dem Betrachter der Videoskulptur Der Weg nach oben (2008) erscheint das Gewirr der Ratten im Glaskäfig eines Tiermarktes in Mexico City und ihr ständiges, vergebliches Streben nach oben als verstörender, metaphorischer Blick auf das Verhalten des Menschen und seiner oft animalisch anmutenden "struggle for life" oder "survival of the fittest". Die lieblos aufgeklebte Notiz Exportacion wird zum metaphorischen Menetekel. In der durch die Masse der Tiere und die hektische Bewegung auf dem Video beklemmenden Konfrontation erkennt er eigene Verhaltensmuster. 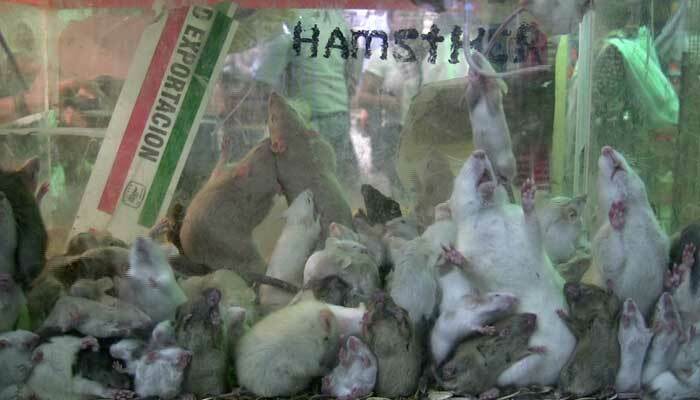 This solo exhibition by the Vienna-based Russian artist Anna Jermolaewa offers a single video projection: Der Weg nach oben (The Way Up), 2008, which shows a group of rats trapped inside a glass cage in an animal market in Mexico City. Restrained in this small space, the rodents ruthlessly try to climb upward and look for escape, one above and against the other, in desperation. By capturing this distressing and claustrophobic scene, Jermolaewa turns a seemingly commonplace aspect of everyday life into a revealing moment with multiple meanings. On the one hand, she makes the viewer a witness to cruelty. 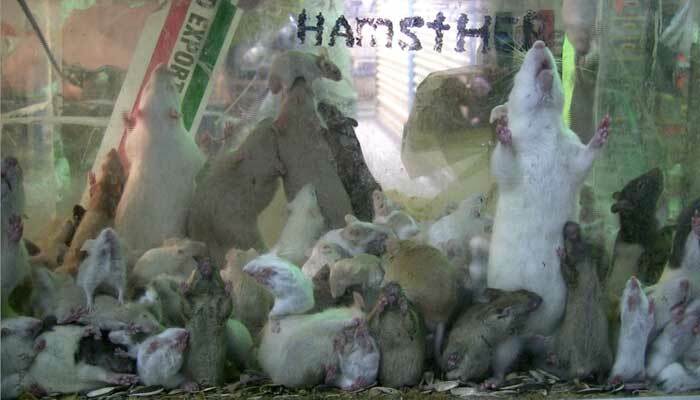 On the other, she draws attention to the rats’ physical and social structures and their similitude to those of humans. Perhaps the rats in this work are used to exalt aspects of our own identity, since we live in a modern society but are hardwired with an animal consciousness. The Way Up might be considered, then, as a choreography of survival attempts of the day-to-day variety in our not-so-human environment. 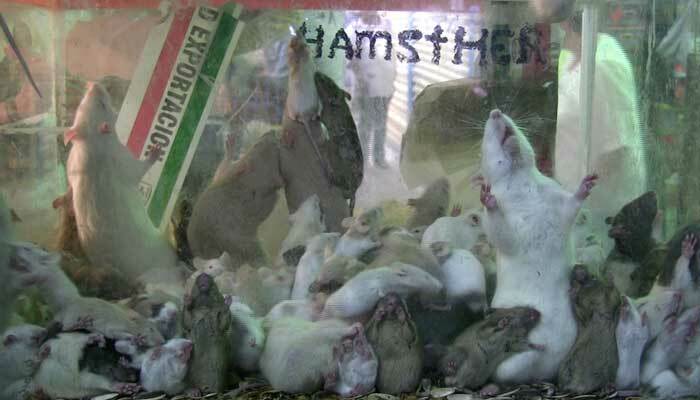 The way up (video sculpture, 2008): we see a fish tank used as a glass cage for closely packed rats on an animal market in Mexico City. We see how rats, known for their distinct social intelligence, behave when confined to a much too small environment. They ruthlessly climb on top of each other in a continuous and futile striving for the top. Each against all. This scene can be interpreted as the struggle for survival in microcosm, in a social system with hardly any perspective. The notice on the glass "Exportacion" (Export) could be read as an omen. The impact of the video is enhanced by means of a sculptural construction suggesting a 1:1 model of the original glass cage. 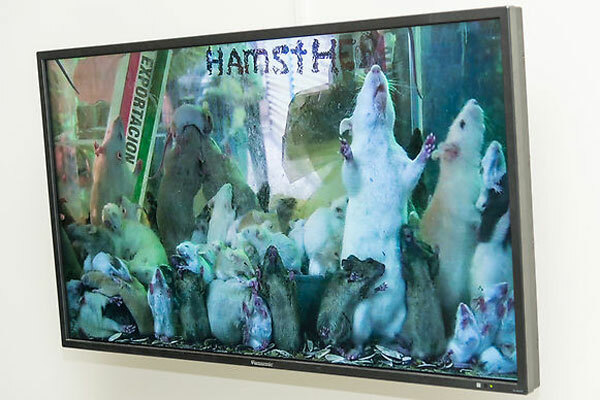 The appearance of the video-sculpture hides a subtle trick: a video projector in the base projects via a mirror onto the glass through which we see the agonising of the rats, their desparate attemts to climb up the screen and their bodies squeezed against it. The physical parameters of the object emphasise the claustrophobic conditions within the cage, and suggest the restrictions of the viewers' own environment.